Almost a year to the day another building exploded in Manhattan, two men were missing and the East Village neighborhood was rocked to its core, literally and figuratively. A commonality with disasters is that heroes emerge; some tried and true such as the FDNY and NYPD, some expected like the Red Cross, and others are born in the moment: brave civilians who climb fire escapes and run into burning buildings to rescue neighbors. The thread woven amongst them is that they all answered a call to help a community. The Red Cross’ reception center was working tirelessly assisting displaced residents, and those otherwise affected by the blast. 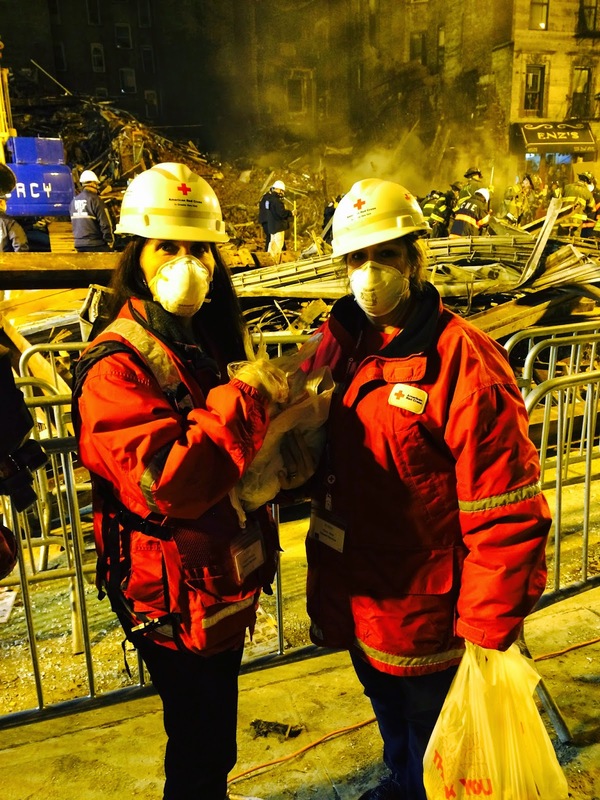 Red Cross workers supported the families of those who waited for word on their loved ones who were last seen in the building moments before the explosion. As residents streamed into the center, a few blocks away, teams in disaster relief trucks supported first responders. I arrived day two and the painstaking process of digging through debris was well underway. I was part of the team relieving the morning shift. We donned helmets and masks and squinted our eyes against the hazy smoke still filling the sky. We watched the surreal landscape: huge cranes scooping piles of smoldering bricks and debris gently laying it aside. A hush overcoming the site, the cranes hovered like silent birds while dogs and humans searched the ruins, fire fighters turning over each piece brick by brick, timber by timber. It was a reverent moment, searching for a loved one: someone’s son, someone’s brother, the painstakingly slow process of a search and rescue when the promise of hope still hung in air of dust. I spoke with residents who asked ceaselessly about the victims when one man asked about the girl who was rescued from the fire escape. I told him I did not know, and he told me he was the one who had climbed those steps and brought her down safely. I hugged him and told him he was a hero but he was too humble to accept the praise. Even so, he had joined those ranks. He needed to talk and as Red Cross volunteers we were happy to listen. As the night stretched out we met with more residents who wanted to speak of loss, hope, and of rebuilding above the sounds of steel scraping the street as the crews searched. We spoke with construction workers who found themselves on the scene trying to process what they were seeing, hearing and feeling. Seasoned firefighters shared stories about 9/11 with us, the parallel process bringing memories to the surface for them, then they returned to the search not ready to give up hope. Later that night we were approached by another neighborhood resident that wanted to know, “How do you do what you do? How do you see all of this and still come back day after day?” He needed to speak and so we listened. He had been across the street when the explosion first occurred. At first, his natural instinct kicked in and he ran in the opposite direction of the boom. Then he turned and ran into the building. Ultimately, he made two trips rescuing a young woman, and several men who worked in the restaurant. He shared, “Man, I thought I was going to die, I just thought, God get me out of here I don’t want to die. ” But he went in twice before flames singed his skin and the heat held him at bay. We gave that hero more hugs, and listened as he sorted his feelings, giving him the number of the Red Cross so he could continue to talk. He kept repeating, “Man, you guys are great. I love the Red Cross, thank you!” We moved back into the night to the first responders as the streets emptied. I know as a Red Cross worker I see the best in people in the worse of situations. I shake hands with heroes, and work shoulder to shoulder with compassionate people dedicated to relieving the suffering of others. As a Red Cross volunteer, I am grateful to work alongside so many heroes. That is what I told that hero. That is how I come back day after day. To learn more about the Red Cross Response to the East Village explosion, click here. So well said, Elaine! Thank you to you, Doreen & all the Red Crossers sharing their hearts and talents every day 24/7/365!